Bethany Ashton Wolf wrote and directed this easy listening feature that is loosely based on the novel of the same name by Heidi McLaughlin. She developed all of the original songs in the film with Brett Boyett and Jackson Odell two years before shooting commenced. The book's main character was a rock singer, which was changed to country music as Wolf had wanted Travis Tritt to play a cameo role in the film and sing an original song. 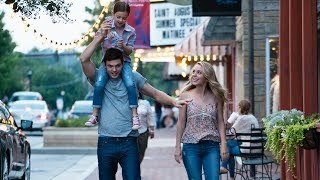 The simple story has the usual tropes of a Lifetime Movie Channel fare of love lost, found again, catharsis and redemption as told by beautiful young actors in a serene small town, USA. Alex Roe plays Liam Page, who is now a big ticket country star who ran out on his wedding day to Josie (Jessica Rothe) some eight years previously. He's your typical indulged artist, sleeping with groupies, and self centered, watched over by is co-dependent manager (Peter Cambor} who is reminding him that the record label wants new songs. Except Liam has a writers block at the moment while sulking over his life choices. When he hears that an old friend had passed away in his home town, Liam runs away from his responsibilities of his career to go back. It's a small town, his dad is the pastor (John Benjamin Hickey) and everyone was pretty disappointed that he ran off on Josie. His welcome back was less that heartwarming. Josie punches him in the gut when she sees him. He tries to make amends and discovers that Josie has a 7 year old girl named Billie (Abby Ryder Fortson), which happens to be the name of Liam's late mother. Wait, does this mean...? The rest of the film follows Liam wanting to get to know his daughter, trying to warm up to Josie, making peace with his father. Meanwhile his manager and PR representative are spinning stories to keep the fans off kilter about his life. Being famous is obviously very complicated. There are some amusing moments like Liam trying to figure out how to order stuff online, asking is manager to send him some credit cards and a car seeing as he just run back home with nothing, riding his bike around town. Billie decides not to make it easy on her father, explaining that she will not ride in his convertible backed by accident statistics. It takes a bit before the looming reality of what it means to be an adult and a father comes crashing down on Liam, and the only way he knows how to deal, is to run. You can pretty much guess what happens to everyone after all they are still very stupid in love with each other. The journey there is saved by the earnest and sincere performances. Plus the music soundtrack is ready for the radio. A neat pleasant movie coming to Netflix soon.